Every now and then we find a perfect practical wedding favor that everyone loves! Beautifully packaged and ready to give, these photo coasters will be lasting reminder for all of your guests of your incredible day. At less than $4 each, they won't break the bank either! 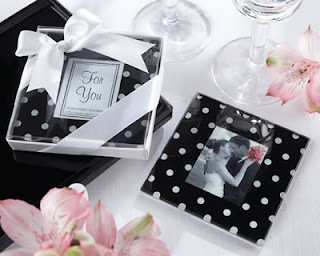 Elegant enough for even the most posh event and playful enough for more laid-back occasions, our black-and-white polka dot coasters will find the perfect "spot" at your tables, too! Set of two black glass coasters with white polka dots and space for a photo in the center. Each coaster measures 3 ½" square. Gift presentation includes a white base, a clear display cover, a "For You" insert in the photo space, and a white-satin ribbon and bow. Gift box measures ½" h x 3 ¾" square. Readers of our WhereBridesGo.com blog and fans on Facebook take 10% off your order with coupon code VIPBRIDE. Shipping is always free for orders over $100 within the continental US. WhereBridesGo.com ... the ultimate online wedding favor and supply store!